CONSTRUCTION TIPS: Cut your dress on 60" wide fabric if you can. Cut the top of the dress pattern on the fold, so that you do not have any seam running from your neck to your wrist. If you can not get 60" wide fabric, you will need to cut the top and skirt separately (still, cutting the top on the fold to eliminate any seam from the neck to the wrist), and join the top and skirt at the waist seam. This is a perfect place to add elastic to keep your dress bloused in place under your belt. The dress has a keyhole opening in the back, no seam down the center back or center front. The back neck closes with hooks and eyes. It is important to get a nice snug fit to the collar. It helps to first stay stitch the neck hole opening of the dress before putting on the collar to prevent it from stretching out. Secondly, I highly recommend adding iron-on knit interfacing to the collar to keep it smooth and from stretching out over time. (However, if your fabric is nylon, you can not iron-on interfacing - an iron will melt nylon). The collar should be fairly snug and fit smoothly, so adjust the hooks and eyes for a nice smooth fit and keep the collar standing upright. FABRICS: The real gown is most likely made of Qiana - a silky nylon fabric that was popular in the 70's and is no longer made. Some nice substitutes are light weight polyester knits (JoAnn's fabrics has one called Jet Set Knit, and virtually the same knit is available in 100% polyester at Hancock Fabrics labeled as Interlock Knit). Cotton/Poly blend T-shirt knits are not as fluid or drapy so I don't really suggest them. Another suggestion is modern nylon/lycra swim wear or lingerie fabric, so long as it has a matte texture, and a nice fluid "silky" drape. (The swim/lingerie/dance fabric must not have a shiny or sparkly texture/effect at all, it must be a very dulll matte finish and have no reflective sheen. Most standard swimwear fabrics are not suitable as they are too shiny/sparkly. Matte nylon fabrics are not easy to find and you will not find them at JoAnns.). 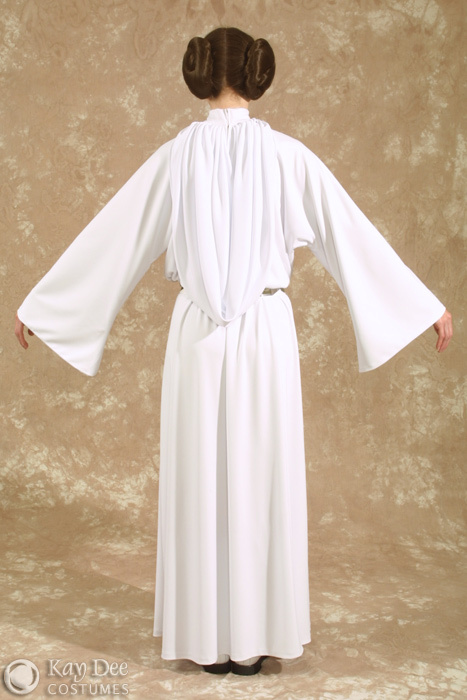 A third substitute with a beautiful drape is rayon jersey knit. I'd suggest avoiding double knits, they are a bit too heavy. It is OK if the fabric is a little sheer. The real dress is self lined. 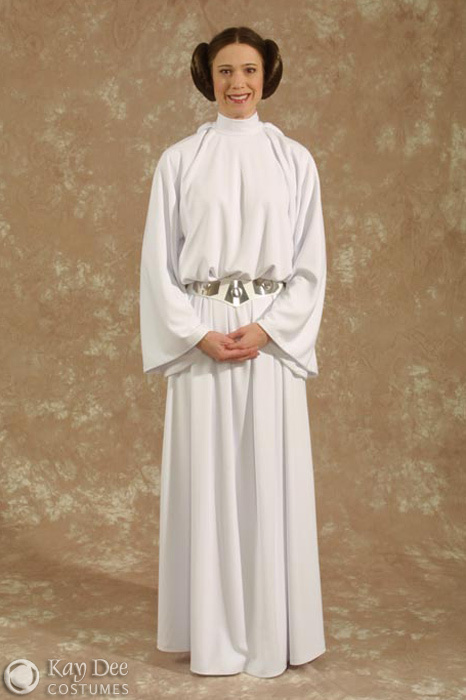 Basically, you should fully line your Leia dress with the same fabric used on the outside. It is double layered so that you can't see through it. I don't suggest using different fabric to line the dress, since this is not how it was done in the movie and often times if knits do not have the same drape or stretch, it will not hang properly. 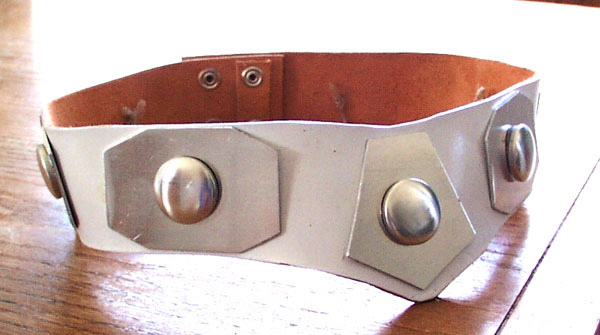 BELT: I drafted my own belt template and made it out of a leather belly strip purchased from Tandy Leather. 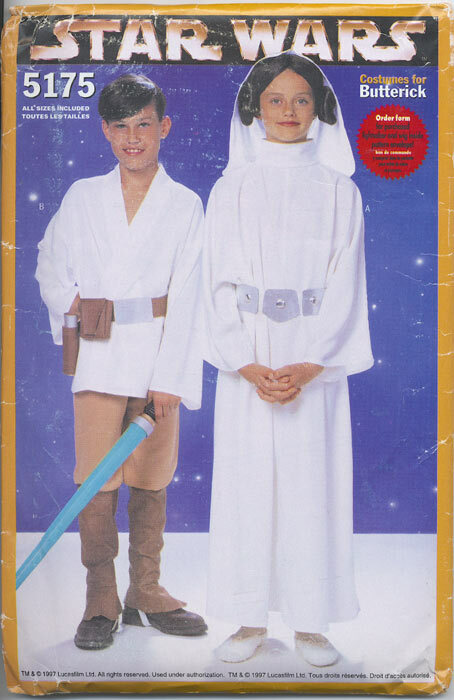 The Obi-Wan's Jedi Academy was helpful with templates for the aluminum belt pieces and tips on construction. 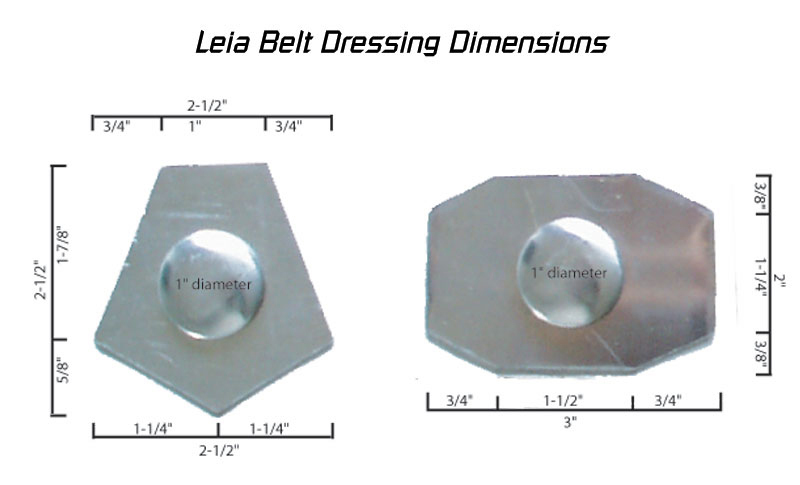 *update* Obi-Wan's Jedi Academy is no longer around :( Let me stress these are not my patterns, or my example photos of my belt. 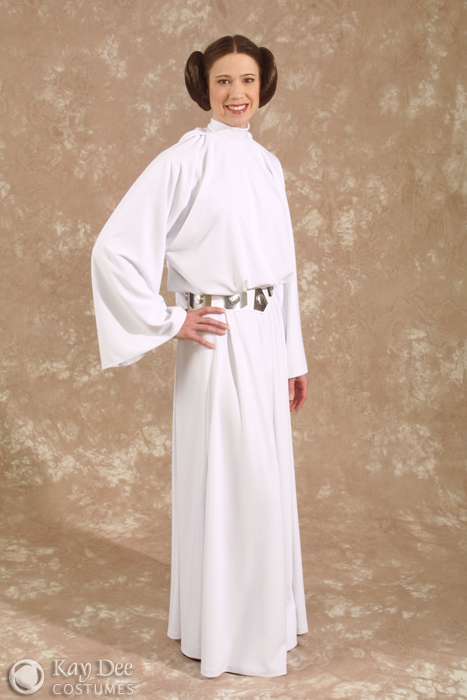 This is the belt I referenced and photos I referenced from the Jedi-Academy web site. I used their metal template. I suggest aluminum sheeting from hardware stores (I have found it in rolls at Orchard, which they cut by the foot, I have also found it a bit thicker in sheets at hardware stores). I have also ordered aluminum sheeting from online metals. Some use tin snips to cut their metal, this can work but can sometimes leave you with curled edges. I happen to have a mini press break which cuts a smoother flat edge. I drilled holes in the center of each metal plate. This is so that you can put the button blank look through the hole. Holes are punched in my belt as well, and the back of the button loop is secured with a small bobby pin and hot glued so it will not slip out or snag the dress. 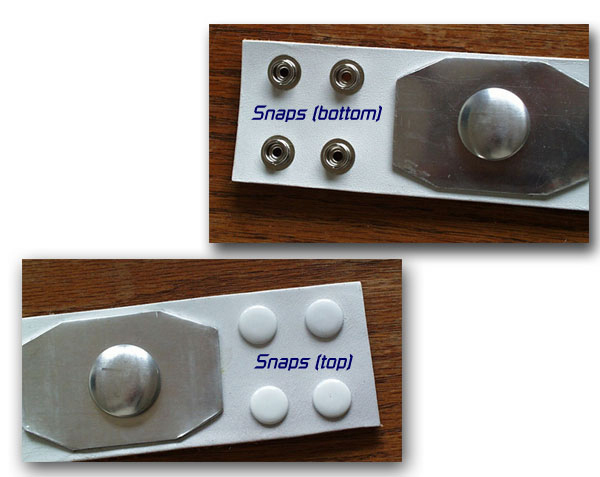 The round bits on top of each metal plate are simply fabric covered button kits, without fabric on them. 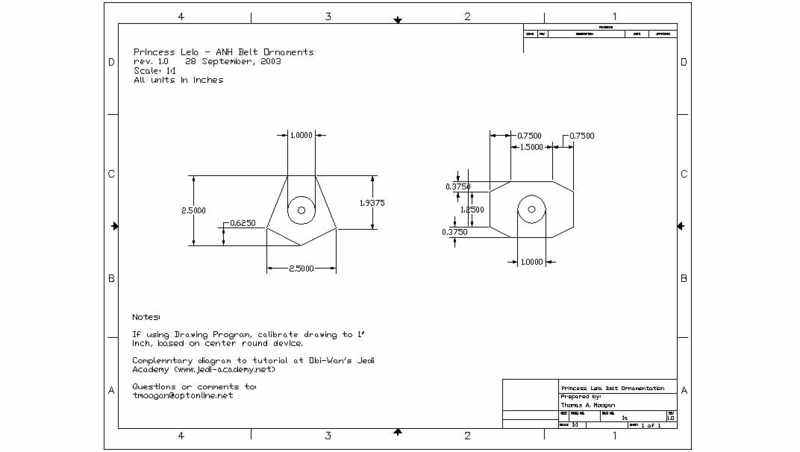 Dritz makes them. The half ball 1 1/8" is the perfect size. I did not draft my belt in exactly the same shape that Obi-Wan's Jedi Academy used, mine has more of a curve to it to fit around the hips a bit better. I did use the leather from Tandy - a vegetable tanned hyde (I believe mine was a belly strip - but be sure to check the dimensions of the hyde you get. Some are smaller than others..) I get the thinner hyde when I can. RESOURCE PHOTOS: The Padawan's Guide was a good source for reference photos, but I also had my own collection of magazines, screen captures and photos to refer to which I intend to scan in one of these days. At the moment most of my research notes and photos can be found at the TFN Costuming and Props Forum. 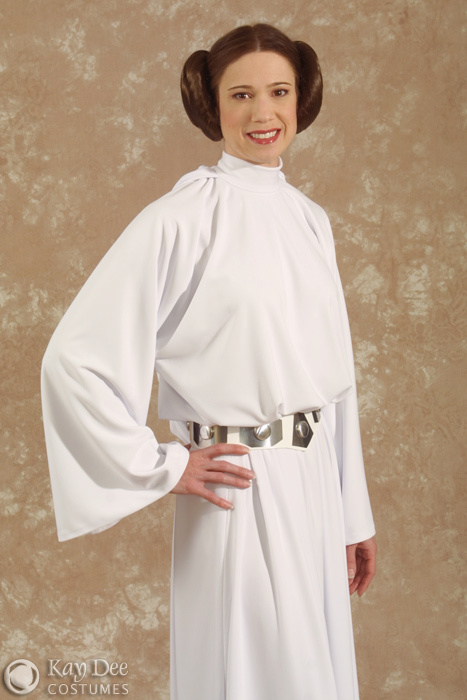 HAIR: Princess Leia's cinnamon bun hairstyle is one of the most recognizable parts of this costume. Making your own Cinnamon buns can be easier than you may think, and you don't have to have long hair to achieve this look. I've tried many different hairpieces and techniques over the years in an effort to find the fastest and cleanest way to do this hairstyle. Drawstring ponytail wigs come in a wide array of natural hair colors and with a bit of searching you can find a brand and color that will be a very close match to your own hair color! They are very easy to work with, and the synthetic hair is usually a high quality so that it can be brushed out with a wig comb to make your buns sleek and smooth each time you apply them. Length: Make sure the length of the hairpieces you use are 26-29" (or longer, it can always be trimmed). It is easiest to work with a ponytail wig that is not layered. However, I do have one 29" long wig that is slightly layered and with some extra effort I can tuck the layers into my bun. I currently use Tempt-Tousled Hairpiece by TressAllure - Color 10R Medium Brown. (This hair piece has been discontinued, but you can find other jaw clip ponytail wigs if you search wig web sites or stores). This hair piece actually comes on a jaw clip comb. It can be converted to a drawstring style by carefully pulling the wig netting loops off of the jaw clip and discarding the jaw clip. 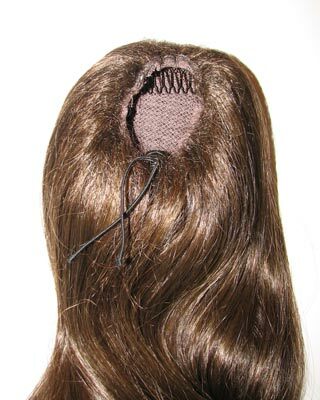 Using a large needle, thread a narrow elastic cord through the outer edge of the wig netting. If you'd like you can add a small wig or hair comb into the top of the netting to make anchoring the hair piece onto your own hair more secure. Another suggested style and brand is "Sensuous" by Forever Young. Don't get the style called "Sultry." Some web sites mistakenly advertise that it is 26" in length when in fact it is only 21" in length. 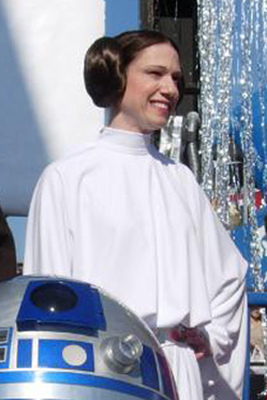 My hair has blonde highlights, but I like to cover them up and darken my hair when dressing as Princess Leia. If you'd like to experiment with temporary hair color I recommend using a mixture of Fanci-Full Temporary Haircolor Rinse and Fanci-Full Color Styling Mousse. I usually mix the "Black Rage" with "Chocolate Kiss". There are quite a few colors to choose from, and sometimes simply using a color to slightly change the tone of your hair can help it match your hair pieces a bit better. The color washes out when you shampoo. 1) Part your hair down the center and put your own hair into little buns right by your ears. I find that wetting my hair and wrapping it tightly with hair nets helps keep them compact. 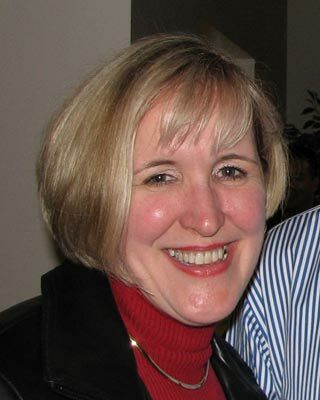 If you have a very short bob like my friend docrichsgirl (photos below), you can put your hair into tiny pig tails. If you have stray hairs at the base of your neck, they can be brushed toward the pig tails and glued in place with hair styling glue. 2) Put the drawstring ponytail wig over your bun or pigtail and anchor it in place with a bobby pin. 3) Carefully swirl your ponytail wig into a bun. I find that using extra long jumbo roller bobbypins help anchor the large bun securely to your own bun or ponytail that is hiding underneath. I also use a few U shaped hair pins in various lengths (usually the long ones). 4) If you want to make sure your bun remains secure and in place, use matching invisible hair nets over the buns. 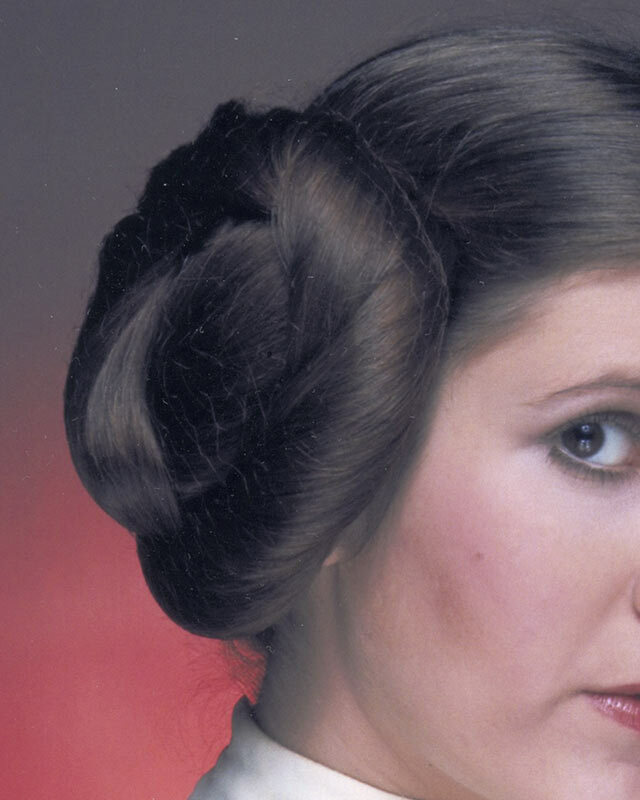 (If you look closely, even Carrie Fisher wears a hair net in some of her studio portraits!) They are usually a bit large, but the extra netting can be wound up and tucked under your bun with a bobby pin Sally Beauty Supply usually has a wide range of colors that will blend in nearly invisibly. 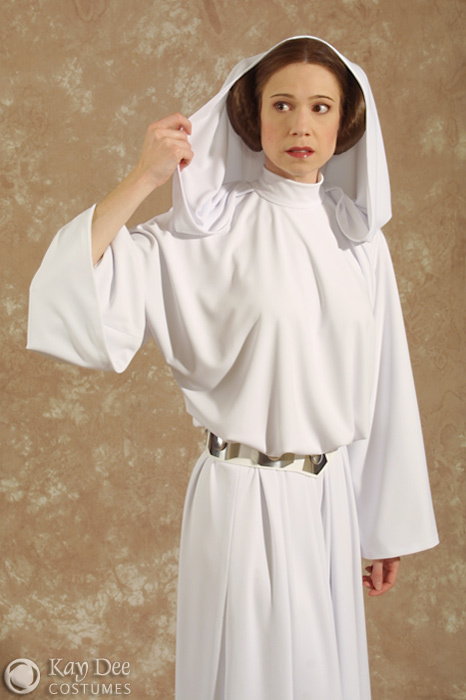 There are two types of braiding hair that can be used to make your own Leia buns. Many people have found that the slightly kinkier "Synthetic Kanekalon Jumbo Braid" is easier to work with because it isn't loose and slippery. 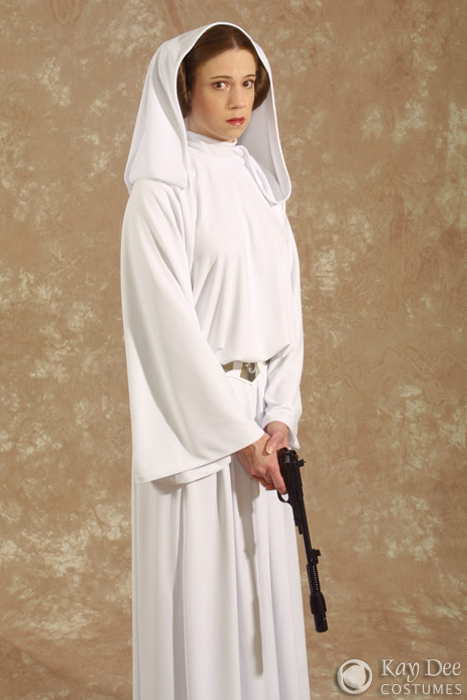 In the photos of my costume at the top of the page I used the "Silky Straight Kanekalon Braid." This hair was very troublesome and time consuming for me to work with. Although I was happy with the results when I was finished, the hair was so slippery that it took too much time to work with it. 1) Get 5 packs of very long synthetic hair called Silky Straight Kanekalon Braid. I've found the best place to order from is Doctored Locks. (I use Light Medium Brown 12 because I'm not quite a brunette). If using the Kanekalon Jumbo Braid, you will only need 2-3 packs. 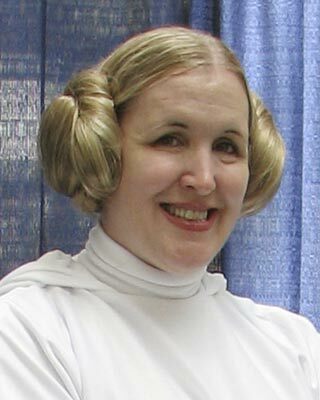 2) Make your own hair into little flat buns or pig tails. 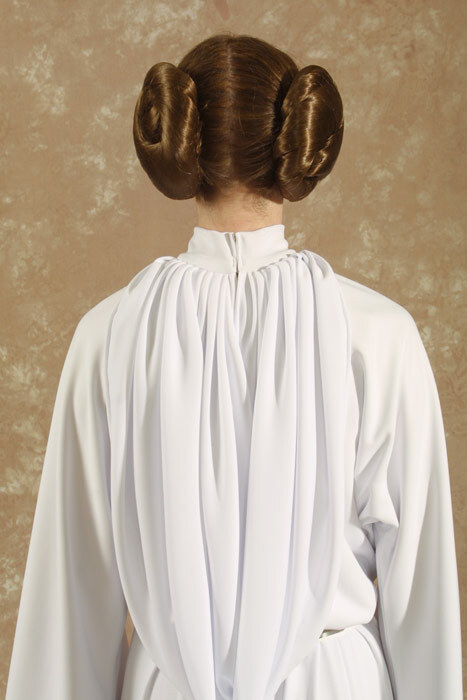 3) Each Leia bun uses 2.5 packs of the silky straight hair. It comes folded over in the center, and I just rubber band them together in the center. Twist the hair together and swirl into a bun shape. If using the puffier Kanekalon Jumbo Braid, I believe each bun uses 1 or 1.5 packs of hair. 5)Finish off with an invisible hair net in matching color to keep the hair perfectly styled, and stray hairs at a minimum.